Gardaí and emergency services were called to a scene outside a hotel on Bray’s Main St.
Main Street in Bray (file photo). GARDAÍ IN BRAY are investigating an incident in which a man was discovered with serious head injuries in the town. Gardaí and emergency services were called to a scene outside a hotel on Bray’s Main St at 2am this morning. A man was found unconscious with a serious head injury. Investigating gardaí are currently investigating all aspects of this incident to establish the facts. The scene is sealed off to facilitate a Garda forensic examination. Witnesses are asked to contact Bray Garda Station on 01-666 5300. Email “Gardaí investigating after man discovered with serious head injury in Bray”. 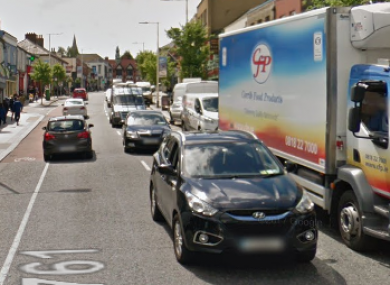 Feedback on “Gardaí investigating after man discovered with serious head injury in Bray”.